If you feel like everything is starting to taste like a piña colada, it isn’t just you. Coconut is in everything. Packaged soups, baby foods and snack foods are made with coconut oil, flour and shavings. Gyms are stocking coconut water. For some, coconut oil is a substitute for butter on popcorn, and coffee shops are spooning it liberally in blended lattés. The flavourful ingredient went from a garnish on a cake to a base in foods in part because consumers no longer worry about its fat content. It is also increasingly promoted as healthful: Coconut sugar has a lower glycemic index than ordinary sugar, nutritionists say, meaning it can cause blood sugar to spike less, which may help stave hunger. Consumers seek such plant-based foods because they can help them stick to popular diets, such as dairy-free or gluten-free. Coconut water took off a few years ago as a natural sports drink high in electrolytes such as sodium and potassium. Then it became a darling of the dairy case, sold alongside soy milk and almond milk. 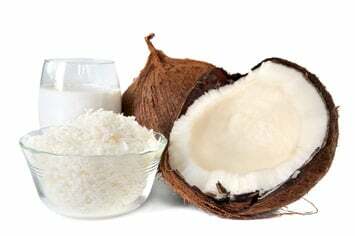 The number of coconut-containing product launches increased an average of 21% a year in the last five years, according to Innova. Coconut follows in the footsteps of foods that have seen their names in lights before falling out of favour, from kale to broccoli rabe and sun-dried tomatoes. Such trends typically last two to five years and may be influenced by factors such as plentiful supply or scientific studies that demonstrate health benefits. Coconut pieces are a popular alternative to potato chips. Bare Snacks, based in San Francisco, has more than doubled the number of its coconut-containing products in the last year to 10, including new coffee bean and sweet ginger flavoured chips. This month it is launching a new line of coconut bites with chia seeds in 2.8-ounce bags for $4. Founder Vincent Kitirattragarn says people tend to have strong feelings about coconut: About 80% of his coconut chip consumers are women. “I attribute that to the prevalence of coconut in beauty care,” so it is more familiar to them. A common complaint is the mealy texture of coconut, which often gets stuck between teeth. “Getting to a smoother mouth feel is one big technical area” of development, says John Ghingo, president of plant-based foods and beverages for White Wave Foods, which markets So Delicious coconut milks and yogurts. For others, the flavour is too strong. Where does all the coconut come from, consumers may wonder. Three-fourths of global production comes from Indonesia, India and the Philippines, which are benefiting from the demand surge. In the Republic of Indonesia alone, coconut exports doubled to bring in $1.65-billion in 2014, up from $800-million in 2010, says Samit Chowdhury, who heads the Singapore-based Coconut Knowledge Center for Tetra Pak International. Coconut prices nearly doubled in that time in India, and have gone up elsewhere as well, he says. Tetra Pak packaged over 800-million litres of coconut-based products in 2016, up from 710-million litres a year earlier. Coconut products became such an important business for the company that Tetra Pak launched a Coconut Knowledge Centre in Singapore in 2012 to research the supply chain in response to growing demand, including running product and processing tests with regional universities. Hain Celestial, a top maker of coconut oil, says drought conditions and typhoons that blew into the Philippines, its main supplier, have affected commodity prices for coconut oil, which are up between 5% and 7% from a year ago. This year, Hain Celestial’s Jason line launched a Simply Coconut line of toothpastes and touts “made with coconut oil” on packages of its Terra Plaintain Chips. Coconut is a featured ingredient in 77 of the company’s products compared with just 20 five years ago. Bob’s Red Mill Natural Foods says its coconut flour has risen to rank eighth in its lineup of over 60 flours. One of its appeals to dieters is that it is lower in carbohydrates than regular all-purpose flour and has more fibre, says marketing director Amanda Carter, though it has more calories and fat. The company’s coconut flour contains 14g of fat, 57 grams of carbs and 36 grams of fiber per 100 grams, according to the USDA’s National Nutrient Database. Its unbleached white all-purpose flour contains 1.5 grams of fat, 73.5 grams of carbs and 3 grams of fiber per 100 grams. One caveat: Coconut flour is very absorbent and tends to create a dense consistency when baked, says Amanda Carter, marketing manager. The company recommends replacing just 20% of a typical recipe’s flour content with coconut flour.